Week 9 - It's a Short One! I hope that you enjoyed a restful and relaxing break over Easter...I certainly did! Parent Interviews - If you have not already done so, can you please add your name to the schedule outside so that we can have some time to discuss your child's progress. Thank you to those parents that have already done so. 20th Anniversary Celebrations - On Friday 1st April OLC will be celebrating 20 years of education. 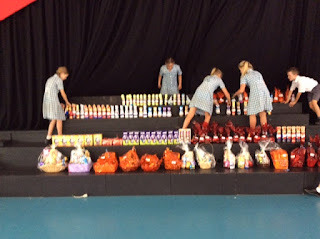 This will begin with Mass being celebrated at 10am in the Hall followed by a morning tea. All parents are asked to provide a small plate to share. 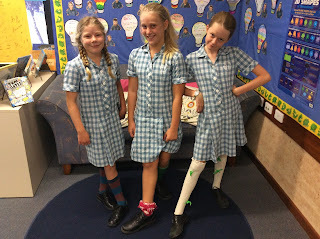 All students are asked to wear their Summer Uniform on Friday. We would love to see as many parents there as possible. English and Maths Feedback Forms - Thank you to those parents that were able to complete these over the weekend. If you did not have a chance to complete them, your child will bring their books home today for you to have a look through. This week we are focused on the reflections of Holy Week. This is a very solemn and important time within our faith. 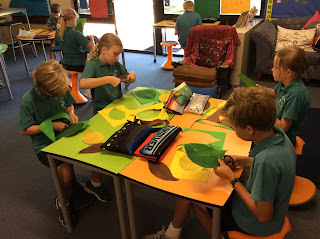 We will be sharing a reflection on Holy Thursday beginning at 9am in the Hall to be led by the Year 3 students. It would be wonderful to see as many parents there as possible. Thank you for your attendance at Mass on Saturday night, it was a lovely chance to get together to celebrate such a special time in our church. I was very proud of all of the students and the mature and respectful way in which they conducted themselves. Chrism Mass - tomorrow the students and I will be travelling to Bunbury to attend the Chrism Mass at the Cathedral. We will be leaving school at 9.30am. I will give students a chance to have some recess before we leave as they won't be back until approximately 1.30pm. We will have a small snack after Mass before boarding the bus to come back to school. Here is a copy of the letter that will be sent home tomorrow outlining the times that I am available for interviews. The schedule will be on our outside door for you to write your name in. A hard copy of this note will be sent home with your child tomorrow. We will be travelling to Bunbury on Tuesday 22nd March to participate in the Chrism Mass that is held at the Bunbury Cathedral. Mass will begin at 11am and will conclude at approximately 12.15pm. At this Mass, the Chrism Oil that will be used for our students when they make their Confirmation later in the year is blessed. The sign of Confirmation is the Oil of Chrism, the most sacred of the oils. During the Confirmation ceremony, a person is anointed on the forehead with Chrism. As the oil is absorbed by the body, it is a sign of how the confirmed person is filled with the Holy Spirit. Chrism is olive oil mixed with a perfume so that it can never be confused with the other holy oils. The Power of the sacraments is the power of Christ's Resurrection. Each year, therefore, Chrism is consecrated, and the Oils of the Sick and Catechumens are blessed, in Holy Week as part of the Easter celebrations. Week 7 - Let's Do This! The remaining weeks of the term are shaping up to be very busy! Please see below for a few reminders for the coming weeks. Easter Egg Raffle - Every year families of OLC are asked to donate an easter egg to be used in the raffle that is held on the Thursday before we break for Easter. If all families can please send in a small donation by Friday 18th March it would be most appreciated. Family Mass - This Saturday 19th March we will be coming together to host the first family mass of the year. A huge thank you to those families that have committed to attending and helping. We would love to have a few more helpers, so please let me know if you are able to attend and if your child is able to help. A pizza supper will be served after Mass. OLC Open Day - We will be hosting our OPen Day tomorrow morning beginning at 9.30am and concluding at 11am. Please spread the word to any families that may be considering OLC for their children. I hope that you enjoyed the Long Weekend...I can see that many of the students are very worn out after a busy weekend getting up to all sorts! Just a couple of reminders for the week. Peron Reserve - Friday 11th March. Please make sure that your child has signed and returned the permission slip needed. 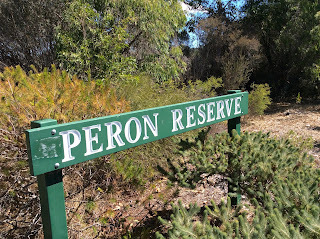 We will be heading to Peron Reserve on Friday afternoon at 1.30pm to help oil and tidy up the viewing platform as well as enjoying a bush walk in which Mrs Hughes will share some of her extensive knowledge about the area and local flora and fauna. If you can make sure that your child has a shirt that can be used to cover their uniform. Year 6 Family Mass - Saturday 19th March. Thank you to those people that have returned their forms. If you are unable to attend, can we please ask that you still return the form so that we are aware.